10,000 Maniacs, the groundbreaking alternative rock band, returned to its roots with a album of British Isle folk songs. &lt;strong style="font-size: 14px;"&gt;Twice Told Tales, released in April 2015, showcases the music that inspired the band over 34 years ago and became an essential component of what has become that very recognizable 10,000 Maniacs sound. 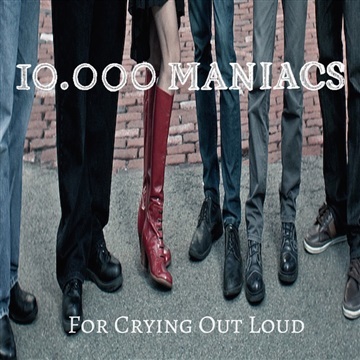 Critics agree that 10,000 Maniacs’ latest album is a musical milestone. Led by Mary Ramsey’s graceful vocal style and her soaring Viola interplay with guitarist Jeff Erickson and anchored by the powerful rhythm section of Jerome Augustyniak, Dennis Drew, Steven Gustafson and John Lombardo, Twice Told Tales is reminiscent of legendary 70’s folk rock pioneers Fairport Convention and Steeleye Span. The recording runs the gamut of British Isle folk styles from instrumental fiddle tunes to lush ballads and hard driving electric guitar anthems. The genesis of Twice Told Tales was during the summer of 2013 tour supporting the album Music From The Motion Picture. Near the middle of every concert Miss Ramsey would perform a beautiful a’cappella piece, the William Butler Yeats poem Song of Wandering Aengus to a rapt audience. She would often follow that with a climactic viola solo eventually joined by the band and back into the show’s finale. 10,000 Maniacs burst onto the music scene in the early 1980’s writing and performing powerful, danceable and socially conscious original material in and around their hometown of Jamestown, New York. By producing, manufacturing and marketing their own recordings 10,000 Maniacs were one of the original “indie” bands. The group toured extensively behind two independently released records, Human Conflict Number Five (1982) and Secrets of the I Ching (1983) on their own Christian Burial Music label. Together with artists like R.E.M., the Replacements and the Pixies they defined college rock and created the first wave of alternative rock bands and what became know as the Alternative Rock format on FM radio. In 1985 they traveled to London to make their major label debut , The Wishing Chair with producer Joe Boyd (Fairport Convention, Nick Drake). Early Member John Lombardo left the band at this point. Over the next eight years, with television appearances on The Tonight Show, Late Night with David Letterman and Saturday Night Live, the Maniacs sold over 10 million records featuring hit singles Hey Jack Kerouac, Like The Weather, What's The Matter Here? Trouble Me, Candy Everybody Wants, These Are Days and Because the Night. With the departure of Natalie Merchant in 1994 10,000 Maniacs continued to write, record and tour, bringing back John Lombardo and promoting band violist and back-up singer, Mary Ramsey to lead vocals. In November 1995, the Maniacs played dates in Cleveland and Chicago. The Cleveland Plain Dealer remarked of their Agora Ballroom show: "The band showed a sold-out crowd the path to its surprisingly smooth and viable rebirth…Saddled with the unenviable task of filling Merchant's shoes, Ramsey brilliantly rose to the occasion"
With over 10 Million records sold in their 34 year career the essence of 10,000 Maniacs remains their startlingly powerful live performances. The core of the Maniacs live show remains its deep catalogue of multiplatinum hits Hey Jack Kerouac, Like The Weather, What's The Matter Here? Trouble Me, Candy Everybody Wants, These Are Days and Because the Night. Whether performing with The Buffalo Philharmonic Orchestra, as they did in November of 200, or October 0f 2015 with the Jon Lehrer Dance Company, the strength of 10,000 Maniacs live is their musicianship. “The instrumentation is flawless, the groups’ thirty-five years of experience is evident in their expertise. Ramsey sings with a calm effortlessness, and whether she’s lending a haunting cadence to a quieter song or belting it out, her voice is a breathtaking instrument itself, with the perfect clarity of a lovingly crafted set of bells…With strong melodies and skilled musicianship, the music stands on its own, requiring no gimmicks or over-the-top showmanship” - Meghan Ritter CrypticRock.com. Live review NYC 6/01/2015.